"Here at last is a single, all encompassing resource where the myriad applications sharpen into a comprehensible text that first explains the whys and whats of each application before going on to the technical detail of the hows." The authoritative guide to MPLS, now in its Third edition, fully updated with brand new material! MPLS is now considered the networking technology for carrying all types of network traffic, including voice telephony, real-time video, and data traffic. 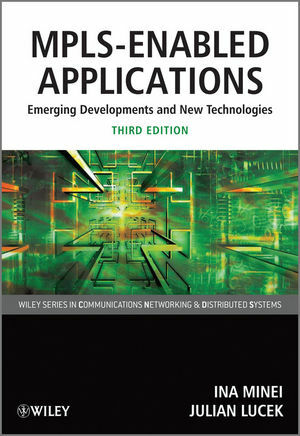 In MPLS-Enabled Applications, Third Edition, the authors methodically show how MPLS holds the key to network convergence by allowing operators to offer more services over a single physical infrastructure. The Third Edition contains more than 170 illustrations, new chapters, and more coverage, guiding the reader from the basics of the technology, though all its major VPN applications. The current status and future potential of all major MPLS applications, including L2VPN, L3VPN, pseudowires and VPLS. A new chapter with up to date coverage of the MPLS transport profile, MPLS-TP. MPLS in access networks and Seamless MPLS, the new architecture for extending MPLS into the access, discussed in depth for both the unicast and the multicast case. Extensive coverage of multicast support in L3VPNs (mVPNs), explaining and comparing both the PIM/GRE and the next generation BGP/MPLS solutions, and including a new chapter on advanced topics in next generation multicast VPNs. A new chapter on advanced protection techniques, including detailed discussion of 50 ms end-to-end service restoration. Comprehensive coverage of the base technology, as well as the latest IETF drafts, including topics such as pseudowire redundancy, VPLS multihoming, IRB and P2MP pseudowires. MPLS-Enabled Applications will provide those involved in the design and deployment of MPLS systems, as well as those researching the area of MPLS networks, with a thoroughly modern view of how MPLS is transforming the networking world. "Essential new material for those trying to understand the next steps in MPLS." "MPLS-Enabled Applications takes a unique and creative approach in explaining MPLS concepts and how they are applied in practice to meet the needs of Enterprise and Service Provider networks. I consistently recommend this book to colleagues in the engineering, education and business community." Ina Minei is a network protocols engineer at Juniper Networks whose focus is MPLS protocols and applications, DiffServ-aware traffic engineering and network convergence. She has helped to implement these and other features into the JUNOS operating system. She is active in industry forums, has presented MPLS tutorials at the North American Network Operators' Group conference and is a regular contributor to the IETF. She is the author of Juniper Networks' whitepaper on Diffserv-aware traffic engineering. Prior to joining Juniper Networks, she worked for Cisco Systems on the development of a next generation router operating system. Julian Lucek has worked with the Photonics Research Department at British Telecom where he co-built the world's first all-optical regenerator before moving into the IP field to evaluate new routing platforms. His current post is that of Consulting Engineer for Juniper Networks working with major Service Providers on MPLS deployments. He is the author of many published papers in the field of communications technology and holds several patents in that area.